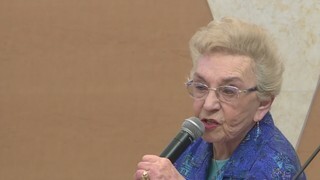 A Holocaust survivor spoke to the Jewish community in Las Vegas Sunday, sharing her story in the hopes that it inspires others. "In camps, we just went from day to day, grateful that we've made it through another day," said Holocaust survivor Celina Biniaz. Biniaz says she owes her survival in part to the man who rescued her and her family: Oskar Schindler. Made famous by the Steven Spielberg film "Schindler's List," Oskar Schindler was a German businessman who is credited with saving the lives of around 1,200 Jews during the Holocaust, by employing them in his factories. At age 13, Biniaz was the youngest person on his list. Biniaz spent time in the deadly concentration camp Auschwitz, before being sent to a factory in the Czech Republic. "It moved me from being taken to Auschwitz and killed, to being taken to Auschwitz on Schindler's List and surviving," Biniaz said. After World War II, Biniaz moved to the United States, but remained quiet about her experiences. Everything changed when Spielberg's film hit theaters. "Putting the film on screen, it gave me a point of reference and an opportunity to start speaking, because now I could say to people, this is really what happened. I was part of it," Biniaz said. Biniaz spoke to members of the local Jewish community Sunday at Temple Sinai. The event was in support of "Life & Legacy," a program dedicated to ensure financial gifts are given after someone has passed away. "All of the social service network was developed by our parents and our grandparents, we need to support that, so that there's a Jewish tomorrow for our children too," said Nancy Shinder, the Life & Legacy Coordinator for Temple Sinai. Organizers wanted a speaker who embodied the idea of "legacy." "Celinia Biniaz has realized that her legacy was her story," Shinder said. Now, at age 87, Biniaz travels the country to share her story -- and the important message that comes with it. "You have to confront your problems in order to move forward in life," Biniaz said. "If I was able to move on, other people with problems can maybe confront them and move on too."